I know someone well who really fits this quote well. I want to protect the identity, so I won’t call out who it is. Let me say that it is very sad to watch this person, who is indeed a very kind and giving person, look around her and seem to rarely have moments of contentment because she is quite often bemoaning what she sees those around her have (at the moment) that she does not have (at the moment). Take an introspective moment into your own life. I am sure most of us have moments of jealousy. I think few people live life without feeling pangs of it. Some definitely are more wracked with it than others. 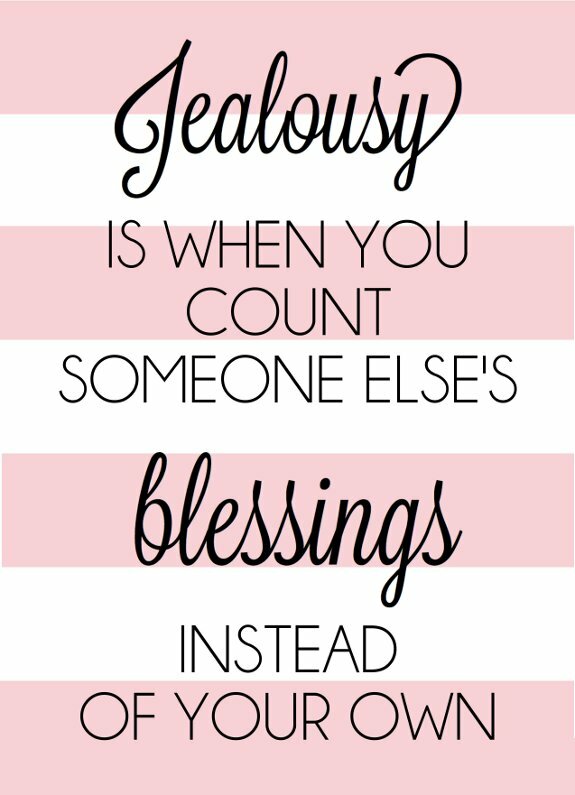 The next time you feel jealousy sweeping over you, take a moment to realize you are counting the other person’s blessings rather than counting your own. In that moment, count your blessings and be happy for that other person for that great blessing in their life. A friend of mine did a devotional at our bible study once from the blog of Ann Voscamp about gratitude, Ann's eloquent words on the matter will stick with me for many decades to come. A grateful heart protects one from many mistakes like jealousy and ill-gotten gain. Thanks for sharing your thoughts on this great quote!